This lack of sleep is killing me. At this point I would be happy with Reagan getting up once or twice a night but this every 20 minutes is for the birds. Not exactly what you'd call a restful weekend. She seemed happy enough this morning, but then the fussies kicked into high gear right before noon. Definitely tummy related, after lots and lots of crying and a stinky diaper, she was finally able to go to sleep. She woke in a much better mood. We headed over to my mom's house this afternoon during the open house. Reagan was so excited to wake up and see her Grandma. She was a little groggy this afternoon but I'm not sure whether it was medication/seizure related or that she just wore herself out with all the crying. She was super cuddly though and I love that. Haven't really seen any improvement seizurewise since upping the Topomax again. I hate that when you make changes it's so hard to go back and recover the previous level of seizure control. I guess the next step would be to increase the Keppra, although I'm nervous about that with her already being a little more floppy than usual. I think we'll probably try increasing her pm dose first. Maybe we'll see double the benefit...less seizures and more sleep at night. Oh that would be nice! Please keep that in your prayers! Not a great night last night. Reagan was up a lot and my patience was definitely being tested. And speaking of testing patience...she's been in a strange mood today. She was very sweet this morning, albeit very floppy. Then we went to a birthday party (the little girl of the people that host our Bible study) and Reagan was super fussy the whole time. It was outside in their backyard and there was little, if any, shade. Reagan got hot very fast since she's unable to sweat because of the Topomax, the crying started up, and we had to take her inside. I can already tell it's going to be a fun summer in Houston with Reagan on Topomax. It makes it nearly impossible to take her outside! Anyway, she's been fussing off and on for most of the day. I'm not sure what's going on with her, but it wouldn't surprise me if tummy pains were to blame. No big plans for tomorrow. We're having an open house in the afternoon, so we'll have to clear out of here for a while (and I'll really have to get cleaning in the morning). It's frustrating because we haven't had any serious interest in our house...and we just want to get out and into a new one story house so we can begin living our lives again! I feel like our lives are on hold right now. I know that we'll sell it when the time is right, but it's just hard living this way. It's kind of the same thing with the seizures. 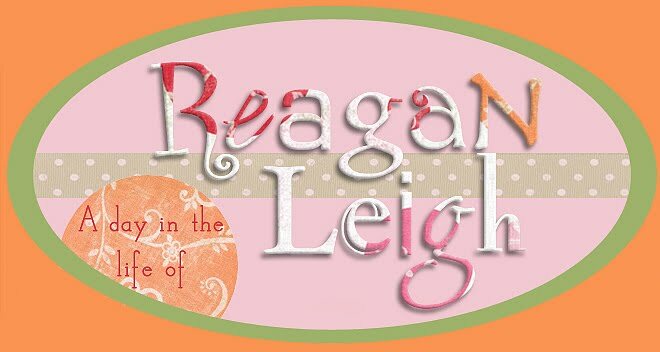 I know God will come through for Reagan when the time is right, but it will be in His time and not ours. I just wish it would be sooner rather than later...or how about now! Please keep her in your prayers! Thank goodness it's Friday. Reagan is really wearing me out at night. She woke up every single hour crying last night. Then at 5:30am she let loose with a super stinky diaper and was finally able to relax and sleep in til 7. Dealing nonstop with tummy issues and seizures, the idea of a consistent good night's sleep seems almost unattainable at this point. But we continue to hope. Every night I still start her out in her crib even though I know at some point (usually sooner than later) I'll be running up the stairs to get her. It's the same with the seizures. We've been battling them nonstop for almost 2yrs now but we still hold out hope for seizure free days for our little one. So keep those prayers coming! Reagan has actually been in a wonderful mood today. She had feeding therapy and OT this afternoon and she was an angel for both! She ate some chocolate pudding in feeding therapy and she did a pretty good job with it. I guess we'll have to go find some soy pudding alternatives once we make the switch. I did buy some soy yogurt to try with her. Should be interesting. She'll be vegan just like my dad! I don't know if the therapy wore her out today or what but she's been super sleepy. She took a really long nap this afternoon, I had to force her to wake up at 8pm, and then she fell back asleep 2hrs later. Not a good sign for sleep tonight. I better go and try to catch a few before she wakes back up! Reagan is still not sleeping at night...no clue what we're going to do about that. But she seems no worse for wear. Today she woke for good around 6am and was SO talkative. It sounded something like this ddddddadeeddddddadadddd. It all kind of blended together but there were a lot of daddy sounds coming out of her mouth. Very cute. There was no chance in her going back to sleep at this point, so we got up and I fed her about half of her morning bottle (that's 2 out of 4oz). We finally got approval for the PT and OT through a home healthcare agency (thanks to Medicaid). They will come out to the house (similar to ECI but they come twice as often), which is nice not having to drag Reagan around so much, but we do miss our other therapists. We had PT scheduled for 8am and OT for 9:30am this morning, pretty tight. The PT showed up at 7:45am, normally I wouldn't be too happy about that, but we had already been up for quite a while at that point so I didn't mind. She worked with Reagan a lot in breaking up her tone and her need to go into extension. It turns out the best way to do that is to cross her legs. Never really thought of that before. So she had Reagan down on the floor doing this and that and next thing I know she said Reagan spit up. I went over and just as I got there she started throwing up all over the place. Not sure what that was about. We changed all of her clothes (and eventually gave her a bath) but she seemed OK. I don't know if she was just putting too much pressure on her tummy after eating or what. Luckily it was before her medicine. Needless to say we had to be cautious with her the rest of the day and she did seem more difficult to feed today so maybe her tummy was bothering her. Who knows. I forewarned the OT before her session and we didn't have any more problems. I finally caved and bought the soy formula online today. Turns out that if you buy two cases, shipping is free. I know we won't be reimbursed for the expense, but at least we can start her on it sooner. I still don't think that's causing her tummy problems, but at least we can rule it out. Reagan continued to be super talkative and high strung all day...she only took two naps, each no longer than 30min. Hopefully that will equate to more sleep tonight, but usually the two are unrelated. One can hope. In my panic I emailed Dr. Chugani yesterday to tell him of my dosing mistake and he emailed me back this morning saying to just keep her at the current dose. When I finally heard back from her local neurologist he reaffirmed that decision. He basically said that Keppra can even be given in extremely high doses for certain seizure types, so not to worry. I did worry, but at least I was told by two doctors that my mistake wasn't nearly as huge as I thought. 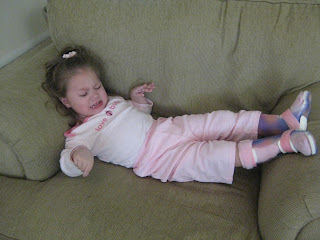 Of course this all explains Reagan's extreme exhaustion after starting Keppra as well as her high blood levels. So for now we'll just keep her at this dose...but I also brought up my concern about the increase in seizures with the decrease in Topomax. He agreed with me that it's worth a try to increase her Topomax (by one pill- which I did tonight), to see if we can get her back to having less. It's really the most significant in the morning. She was up a lot again last night and when I finally brought her downstairs for good (after multiple trips up and down the stairs) she was having a ton of seizures that had to be interfering with her going back to sleep. Poor girl. Despite that, she's been in a pretty great mood today. Reagan's ECI developmental coordinator came by today and then she had vision therapy in the afternoon. More phone calls today trying to get all the documentation we need to try to get Reagan's new formula covered by medicaid (since it's her sole source of nutrition). I have no clue how long this is going to take. I'd like to switch her over now, but I can't even find a store that carries this stuff (and to order it online the shipping is ridiculous). Hopefully they'll get it figured out quickly. Please keep her in your prayers...we could all use some sleep and less seizures! Reagan kept us up again a lot last night. Hopefully tonight will be better now that we're home. We left Austin this morning around 10am and got back at 1pm. The drive was horrendous, with Reagan screaming, crying, and holding her breath nearly every waking moment. Most kids love riding in the car, for many it's the only surefire way to get them to sleep...not Reagan. At one point she was so hysterical that she was choking on her own spit (and almost throwing up). I had to take her out of the car seat to try to console her. It didn't work, but it did put her in a good position to go to the bathroom, and we had to pull over to change a super stinky diaper. Poor thing. Are we ever going to get to the bottom of her tummy issues? We'll probably switch her formula out sometime this week to the soy equivalent of Pediasure...that is, if I can find it in a store. I don't think a milk allergy is at the root of her problems, but whatever, at this point we'll try anything. Thankfully she slept the last 45min or so of the drive and we had a little peace and quiet. My mom (who had been pet sitting Bear all weekend) was waiting for us when we got home and Reagan couldn't have been happier to see her. It was then that we noticed a HUGE red bite mark on Reagan's right upper arm! I guess it's a bite, but I have no clue what could have caused it. Poor thing, maybe that's what was upsetting her? Seizures seem up in number today. She had a lot of them when she first woke up today...more of the small, twitchy type ones. I sure hope we didn't mess this up by reducing the Topomax. She's been doing so well lately. Now, I'm not sure if we should add back the pm dose of Topomax (and would it even make a difference). So as I was debating all of this, I was thinking maybe we need to continue with the Keppra increase. I pulled out the bottle and as I was looking at it my heart sank. OH MY GOD, I made a HUGE mistake! I started her on 0.5tsp 2x day instead of 0.5ml 2x day! That's a big difference! It's 5x the dose she she should have gotten! No wonder she was so wiped out when first starting Keppra! Oh my gosh, I'm just so glad that she's OK. I can't believe I made such a careless mistake. I'm a scientist for the love of God, I know how to measure (and read directions)! I just feel sick about it. But where do we go now? We obviously can't just drop her back down, she was responding positively to it. I need to talk to our doctor...but of course it's Memorial Day and the office is completely shut down. I can call up to Texas Children's but then I get some random on call doctor that knows nothing about Reagan and her issues. I guess I'll just call tomorrow morning and leave a message for her neurologist...hopefully he'll get back to me fairly quickly. Please continue to keep Reagan in your prayers. Reagan seems to prefer her own house because the sleep has gotten considerably worse since we left town. Either that or (probably more likely) it's related to all of her recent medication changes. Who knows. We never know with her. She did, however, wake in a great mood today. Her morning session of therapy went wonderfully...I can't imagine it going any smoother. She just laid there smiling the entire time. She held off for quite a while but thankfully finally squeezed in a nap before we had to leave for the second session. The second session wasn't as smooth as the first, she did get a little irritable, but we were able to snap her out of it relatively easily. It's hard to say what we think about the therapy. The concept makes sense, I'm just not sure that the seemingly small amount of manipulation that was done over these 4 sessions is going to make a difference. We'll see. Time will tell. (I may try to post a small clip of one of her sessions when I get a chance.) I'm sure the sessions are only as good as the practitioner. Obviously if we had seen Anat Baniel herself, we might expect to see immediate improvements. While there are no ABM practitioners in Houston, this method was derived from something called the Feldenkrais Method and there are practitioners of this method in Houston. Actually our lady here in Austin has recommended a specific woman in Houston who has experience working with special needs kids. So we may try a few sessions with her. Seizures seem to be increased a little today. Yesterday she was having very few. I hate having to change her medication so much. Maybe the increase is due to decreasing her pm dose of Topomax...who knows. Overall she's still doing well on the Keppra and the drowsiness is all but gone since switching the dose to 1/4 tsp 3x day. Continued prayers needed in this area. We're still planning on heading home tomorrow. Please keep us in your prayers as we make our way back to Houston! We made it safely to Austin last night. Reagan got sick of being in the car towards the end but it was more whining than actual screaming her breath away. We lowered her Keppra dose last night down to 1/4 tsp (3x day) and so far so good. It wasn't the best of nights sleepwise, but it really seems to have helped her awareness today. She hasn't been at all groggy like she's been since starting the Keppra. She was in a great mood this morning, very talkative and happy. Therapy went fairly well. It's different to say the least. Today we met her in a studio where they also have an herbalist, acupuncture, and massage therapy. I was very quiet and dimly lit. The practitioner spoke very softly and worked slowly and calmly with Reagan (even though at times she was a crying maniac). The first session she explained some of the philosophy behind the method to us...for instance, with Reagan self awareness is very important. Reagan has an arm, leg, etc...but she's not really aware of them or how to use them. She would apply light pressure or pulling to different areas almost like I would think a chiropractor or masseuse would do, but very gentle and never forcing anything. Reagan was in a not so good mood this afternoon, and I thought we might have to cancel altogether, but she pulled through and got a good 30min of uninterrupted happy therapy time with her. So the plan is to have two more sessions tomorrow, one at 10:30am and one at 4pm. Hopefully tomorrow will have less drama than today. She's been pretty fussy tonight as well, so I'm just hoping for some solid sleep tonight. We're pretty exhausted. I'm lowering her Topomax down to 4 pills for her pm dose (60mg 2x/day), so that's a lot of medication changes in a short period of time. Please continue to keep her in your prayers! Thought I'd do an early post since we'll be on the road tonight. Not much going on today. Just trying to pack up everything for our Austin trip. We'll be hitting the road some time after Mike gets off work. Reagan only had one therapy today, vision first thing in the morning. I feel like I've been on the phone all day with one doctor's office or the other. I put in a call to the neurologist this morning asking about the Keppra to see what he thinks about her being so heavily sedated on it. Meanwhile I sent an email over to Dr. Chugani in Detroit and he emailed me back very quickly suggesting maybe we should lower the dose a little to see if that helps, he said to 1/4 teaspoon 2x day (she's currently at 1/2). Then this afternoon I finally heard back from her neurologist and he suggested lowering it to 1/4 teaspoon 3x day. He thinks that by spreading it out a little, that will help. When Reagan had her blood work done last week (after only being on Keppra for a day and a half and at her current dose) her Keppra levels were fairly high. Her doctor said that he wasn't expecting them to already be that high, so maybe Reagan just metabolizes this drug differently than most. Who knows. I think we'll probably lower it tonight and hopefully it will help with her awareness this weekend...I really want her to do well with this therapy. My only concern (which is a big one) is an increase in seizures. Please keep all of this in your prayers. And say some extra prayers for her tomorrow (Sat) at 10am and 4pm...that's when she's scheduled for her first two therapy sessions. We need her awake and cooperative for this! Come on Reagan, you can do it!!! Sleep was very similar to the night before...which wasn't too bad. Reagan started in her crib and ended up on the sofa, but nothing's new about that. She's still very groggy on the Keppra. I was sure hoping she'd get over it by now, but no such luck. I am very concerned about how this is going to affect her therapy this weekend...please keep that in your prayers (and for a safe trip as well). We need her awake and alert- and that's a lot to ask these days! No therapy today...just appointments. First thing this morning we had an appoinment to have a swallow study done. It was actually pretty neat. It's a mobile van that goes out to different therapy centers to do modified barium swallow studies on children while their respective feeding therapists participate in the whole process. It was a very different experience than our first swallow study done at TX Children's with Reagan screaming bloody murder the whole time. They did find out one very interesting piece of information, Reagan's swallow looked good. She's not aspirating and she seems to be handling the formula/purees fairly well (it's not remaining in her mouth, she's actually swallowing it). All of that is good to know. Then this afternoon we went to Reagan's follow-up GI appt. Not exactly the most enlightening appt. They still really have no clue as to why Reagan is having so much stomach pain. Suggestions included giving her a glycerin suppository at the first sign of fussiness, changing her formula over to a soy based formula, trying a new brand of probiotics, and several potential tests they might run (GI motility test, upper GI, and endoscopy). In all reality, just a lot of guessing. I guess we're going to try a few of these things and see what happens. I have been giving Reagan yogurt on a regular basis the last few months, as it's one of the few solids she actually seems to like. Maybe it is related to the milk products (although I doubt it). The stomach pain she's experiencing is very real and it needs to be addressed...I just hope we can get to the bottom of it. Please continue to keep this in your prayers. Sleep last night was slightly improved from the night before, although Reagan did wake up screaming bloody murder a few times. I'm thinking that it might have been tummy related because she had a dirty diaper waiting for me when she woke up this morning. She's got a GI appointment tomorrow and I plan on discussing that with her doctor while we're there...although I admit I don't have much faith in doctors anymore. I would like to think she could figure out what is causing Reagan to have so much stomach pain, or even suggest something that might help ease her pain, but I doubt it. We've been there, done that (months ago)...so we'll see. We just want some relief for her. No child should be in this much pain every time they have a bowel movement (or gas). Reagan had PT and OT today, although she was a little floppy for both. 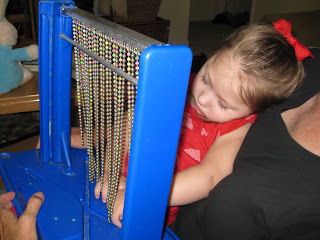 Her new OT brought out a neat bead toy that Reagan really seemed to like. It's a little old and doesn't play music anymore like it should, but Reagan still loved it. Maybe we'll have to get this one for her. This weekend we're taking a trip to Austin to try out a new type of therapy with Reagan. It's called the Anat Baniel Method (and this lady is only one of two practitioners in Texas). Several people have mentioned it to me and I decided since typical physical and occupational therapies haven't really worked for Reagan, maybe it would be worth it to try something new. It's a little "out there" for my scientific brain to grasp...in theory it makes sense to me (it's just the how that I don't quite understand). I won't even try to explain it right now, I've read about it online and watched many convincing videos, but I think it's something you have to see for yourself with your child. I think if it works for Reagan, it will be obvious. Reagan has been in conventional therapies for 1.5yrs and has made little if any progress, so I think it will be immediately obvious if she's responding to this therapy. I'm very excited to see what happens. We're planning on doing 2 sessions on Saturday and 2 on Sunday. They say that if it is going to work for a child, it should be apparent in the first few sessions. It is NOT covered by insurance, but thankfully we still have Reagan's birthday money stored away for just this sort of thing. My only concern is that her altered state of mind (the drowsiness from Keppra) might affect how she responds. Please keep all this in your prayers. I want to see great things! I want to see progress! To us, any forward progress would be HUGE. Apparently more than one good night's rest in a row is too much to ask. Last night Reagan was up a lot again. Only this time she'd wake fussing, I'd jump out of bed, run up the stairs and by the time I'd get to her crib she'd be back asleep again. She did this multiple times and I guess I was just too tired to think about the fact that I should just wait to see if she'd go back to sleep on her own. When I finally decided to give that a try, it didn't work, and I was forced to go get her and bring her downstairs. What's crazy is that Keppra seems to be making her more sleepy during the day, but not so much at night. There are times during the day where she can barely keep her eyes open. This isn't really translating into longer naps, just an overall grogginess that I'm not too thrilled about. She had OT and PT today with ECI and she was pretty dazed & floppy for both sessions. I spoke with her neurologist about it this afternoon and he said that we can try lowering her Topomax a little to see if that helps (it also needs to be lowered because she is still borderline acidotic). The only problem is that I don't remember Topomax making her sleepy, so I'm not sure how that will help. We'll see. I'm willing to give it a try. We'll lower it by one pill tomorrow morning, so she'll get 4 in the am (60mg) and 5 in the pm (75mg). We'll give that a few days and then probably go down to 4 pills 2x/day. For now we're just going to hang tight on the current dosage of Keppra. It definitely seems to be decreasing the overall number of seizures she's having...which is awesome...but the drowsiness is still a big concern. Hopefully we'll see some improvement in that area over the next couple days. Please keep that in your prayers. Below is a picture of my little fighter. She was super sweet and loosey goosey all day today but the second I tried to put her AFOs on her she went into extension and stiffened up like a board! I could only leave them on for one hour, she was crying and fighting against them so much. Today has been a much, much better day. Thanks for all the prayers...they're working! It all started out with a good night's sleep last night. Reagan woke up only once around 2am, but went back to sleep fairly quickly after I transferred her to the sofa (that trek up to her room is just too much in the middle of the night). There she slept until 7am...thank you Lord! She's actually been in a great mood today...whatever was ailing her this weekend seems to have vanished. At times she's a little zoned out (thanks to Keppra, I guess), but overall she's been such a sweetie. We did Feeding Therapy and OT today and she did fairly well in both. In feeding she did a lot more stretching than eating, but she really needs that so it worked out just fine. Then she tried to sleep through OT but her therapist woke her up and made her do some serious work. Lots of weight bearing on her arms, but Reagan did really well with it. We came home and she took a good long nap, waking up in an even better mood. She's just been smiling non-stop and jibber jabbering in her sweet little baby voice all afternoon. Just the cutest thing you've ever seen. She's maxed out on sweetness! Now...let's have another good night's sleep! That would be sweet indeed! Last night wasn't the restful night I was hoping for. Reagan was moved to the sofa after only an hour or so in bed. Turns out that was a good idea, because she woke up about every hour and a half or so. Thankfully she wasn't waking in the same horrendous mood of yesterday. And when she woke for good it was with a full, stinky diaper but a smile on her face. Thank goodness. I think we were brought to the limit yesterday and we may have gone off the deep end if she behaved that same way today. She was in a good mood all morning but as the day wore on she became more and more fussy (more whiny than screaming and crying of yesterday). She didn't take much in the way of naps today...just 15min here and there...usually while laying on me (and she'd wake up the second I'd try to lay her down). I was still having a very hard time getting her to eat, so I just took it slow with a few ounces here and there. Then tonight Mike was giving her a bottle and she drank about 3.5oz and then threw it all back up. Lots and lots of throw up. We were all covered. Poor thing. Maybe she's just not feeling well. Who knows. All I know is she did it before her medicine and now I have to try to get her medicine down her without the same thing happening all over again. Please keep her in your prayers tonight. She really needs some rest, so that she can get on the road to recovery (from whatever it is that's plaguing her). What a day. It started off well enough with Reagan only waking once last night, but apparently she got up on the wrong side of the sofa because she's been miserable all day. Seriously miserable. All day long screaming and crying. I don't know if she's ever been this upset, even in the days of colic. I thought maybe it was teething related, since she's been super spitty, but tylenol didn't even make a dent in her fussing so I don't think that's it. I was beginning to think that Keppra might be the culprit, but three dirty diapers later, I think it may be more tummy related. After nonstop crying all day, she finally took a good nap late this afternoon and woke in a much better mood (although she's beginning to get a little fussy again). Now I'm just playing catch up trying to get some food into her. It's hard to feed a child that is screaming her breath away. I tried and she went into a choking, gagging fit. What a nightmare. I just hope she sleeps tonight, we all need some serious rest to recuperate from this day. Please say some prayers for her. Seizures may be slightly less in number but still very intense. This girl needs some relief from this all. Reagan's sleepiness didn't last long. Not even a full day, really. Last night she made it til 4am and then was wide awake. She didn't go back to sleep until around 5:30 and then she woke for good at 7. She didn't even take a real nap today. She took two that were about 15min each. Oh well. It was nice while it lasted. The mellowness is long gone too. She's been quite feisty today, although I think that's more tummy related than anything. She's had several of the screaming, breath holding episodes that only stop a few seconds short of passing out. Not a fan of those. We've actually got a GI appt next week, although the last time we went in she was having the exact same problems with tummy pains and they were never able to find anything that could be causing it nor anything to help it. Very frustrating. We did go in today to Texas Children's for her bloodwork (we actually missed feeding therapy because we had to wait for our favorite phlebotomist). We saw Reagan's neurologist getting off the elevator and he came over and chatted with us. Unfortunately that didn't help him to remember to call us with the results. I guess we'll have to wait til Monday to find out whether or not she can get off the cytra. I already stopped it two days ago, so I hope it's OK. It was just too much. It was such a struggle to get that stuff in her and then we added Keppra and she absolutely hates the taste of that stuff and gags the whole time. I'm worried about that because she's on a super low dose right now and it's still difficult for her to get it down. I think I'm going to talk to the pharmacist about adding some additional flavoring to it to help mask the taste. It's strange, it smells sweet like candy, but it does have a very nasty taste. I just want to see it work for her...we're just so sick of seizures. Please keep her in your prayers. Wow, I sure don't remember Keppra having this same effect on Reagan the first time we tried it. She is totally drugged up! So sleepy. This came in handy last night...she finally slept through the night again. Unfortunately, she's slept through much of the day as well. On one hand, her tone is gone she's been totally loose and relaxed all day, but on the other hand she's had to fight to keep her eyes open all day. It's really something. I don't know if I've ever seen a medication have this much of an affect on her. And she's at such a low dose right now! Now I don't know if it's because she's been sleeping off and on all day or what, but she's had surprisingly few seizures today. Keep those prayers coming in that area! Tonight she's been more of a handful. We went to Bible study and she whined, fussed, and cried through most of it. I guess the sleepy effects of Keppra had all but worn off because she was super irritable and spastic again. We suspected tummy pains and sure enough when we got home, she produced. Too bad it didn't seem to provide her much relief. She continued to cry until she fell asleep. Hopefully she'll have another good night's sleep tonight. Please continue to keep her in your prayers! Good news. My mom's heart catheterization/angiogram came back fine. They didn't find any blockages whatsoever. The doctor said he was very concerned when she came in on Monday with chest pain and then her stress test came back abnormal, so he was relieved to find that everything looked OK. They still aren't really sure what's causing the chest pain, it could be the blockage of a very small arteriole that isn't that important to the overall health of the heart. So...good news. Thank you for the prayers. I left Reagan at home this morning with our new helper so that I could go with my mom for the procedure. My sister came over as well to help out because we weren't really sure how long the procedure was going to take. We left at 6:45am and were home by 1:30pm. Not too bad. Thankfully Reagan was in a great mood today...although the seizures have been particularly violent and frequent. I'm glad that we're finally adding something new today. We've decided (or the doctor decided) to start her on Keppra. As always, we're starting off at a low dose 0.5ml 2x/day and increasing it weekly. I'm not really sure how soon we could expect to see improvement. Probably not for a week or two at the earliest. Ugh. These darn medications. Since we were so busy today we didn't go in for the blood draw, we'll probably wait and do that Friday. I did finally hear back from Detroit on the final dates for our trip. We'll probably leave on June 15th and come back on the 18th. We have to check in for her 23hr VEEG by 9:30am on the 16th. That will probably wrap up around noonish the next day, they'll just leave the EEG leads on her head and we'll head straight over for the FDG-PET scan. Then the next day she'll have her office visit with the doctor to find out the results and his overall impression about everything. We'll probably try to head back that same day. No need to stay longer, Detroit isn't really much of a vacation destination. I told her neurologist here about our plans to go to Detroit. He thinks it's a good idea...while he doesn't necessarily think Reagan will turn out to be a surgical candidate, he does think that the PET scan may be able to shed new light on what exactly is at the root of her problems. Maybe this trip will yield some sort of diagnosis. That would be success in my book. Please keep her in your prayers for some sort of seizure relief in the very near future! Also, I'm a little concerned because she had a throwing up incident tonight (it's been a while). She woke from a nap and was fine...happy as can be. I put her in her chair in the kitchen while I made dinner and after a while she started to get fussy. I took her out and tried to give her some juice to calm her down and immediately she started projectile vomiting. I put her on our bed and she continued to throw up. Poor thing. I have no clue what that was about. It was very similar to what she does when she's choking on reflux, but she didn't have anything to eat prior (not food or medicine), so that's strange. Please keep it in your prayers that there's nothing else brewing. I know everyone must be getting sick of hearing us whine about no sleep, but seriously...will we ever sleep again? Reagan was up from 2am-4:30am last night screaming and carrying on the entire time! I'd get her asleep and then the second I'd pull the juice bottle out of her mouth, she would scream hysterically. I can't win. She seemed to be having some tummy pains...she'd have gas and cry and cry afterward. Finally around 4:30, I decided to just squeeze up next to her on the sofa and she went to sleep. What am I going to do with this girl!?! Seizures...still the same...pretty yuck. Some of them are clustering up more than usual, which makes them even scarier. Please keep that in your prayers. This morning we went in for an early session of physical therapy. Reagan was so tight (yes, I know I'll put the AFOs on), but after a lot of stretching she loosened up very well. She did some walking in the walker, but she's just not taking as good of steps as she was before. I don't know what's up. Maybe it's that her PT has been cut in half? It's actually been cut out completely by our insurance, but our awesome PT loves Reagan so much that she has continued seeing her once a week free of charge. She did do some good standing in the walker which really stretched her feet out. 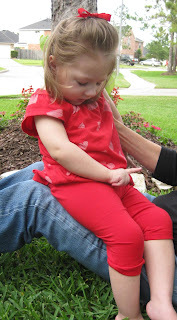 Her therapist put her AFOs on her right before we left and there was a lot less fighting with her to get them on. And when I took them off 4hrs later, there was hardly a red mark on her foot! 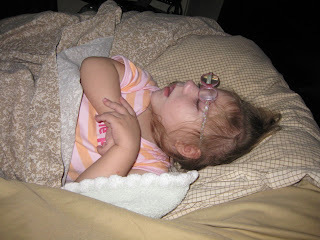 Then this afternoon, Reagan slept straight through vision therapy. Afternoons (aka nap time) are not the best times for her therapy. She actually ended up taking a 4 hr nap! Hello...save that for tonight please! Tomorrow is going to be a rough one if I'm up all night with Reagan. My mom has been having chest pains the last couple days and failed a stress test yesterday, so she's going in for a heart catheterization tomorrow morning (Wednesday). She's very nervous about it, so please pray that everything goes smoothly. My mom and I are super close and she's been so wonderful in helping us with anything and everything. Please keep her in your prayers. Reagan was up a lot last night. It was another of those nights that started in the crib and ended up on the sofa. I remember thinking, maybe I should just lay on the sofa with her, but I kept getting up and down what seemed like all night. I'm so tired of being tired! I know she's still teething, but I don't know if that's the whole problem. I did find out that I've been giving her significantly less tylenol than I should be. Maybe that's why it never seems to help with her teething pain. I had been giving her the infant dose (1.6ml), when she should obviously be getting the child dose now (5mls). Oops. I guess that's the problem with not going in to the pediatrician on a regular basis. Reagan had two therapies today...feeding and occupational therapy. She was asleep for the first 15min of feeding but woke up in a great mood and ate some pudding and smoothie. In OT, her therapist really worked her...she spent a lot of time on her tummy working on her head control and rolling. 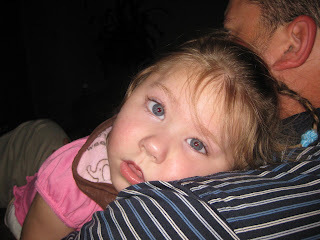 She had a few meltdowns, most of which were related to her being overtired. She crashed the second she hit the car seat. I have a confession to make...I've been really horrible about putting Reagan's AFOs on her the last few days. She hasn't worn them since Friday. With the traveling and everything, it was just so hard. I need to get back into the habit of putting them on her. Seizures are still rough, especially in the morning. I lowered her am dose of Topomax this morning down to 5 pills, so now she's on 75mg 2x day. Hopefully this will be low enough to take her off of the cytra. We'll probably go in Wednesday and have her blood checked. The plan is to start her on Keppra Wednesday night, one week after starting the vitamin B6. Hopefully we'll be able to avoid the increased irritability this time. God knows we don't need more of that! Please continue to keep her in your prayers. Happy Mother's Day everyone. I read a great post today by Cody's mom Shawna. It gives you a glimpse into the life of a mom whose child has uncontrolled seizures. It's not a glamorous life to say the least, but for now it's my life and the life of so many mothers around the world. Please keep these mothers and their children in your prayers. We had a fairly decent night's sleep last night. Reagan still woke up several times, but at least she slept in a little this morning (and so did we). Reagan has been in a great mood today. She's been super talkative...it's just so cute! She did OK with the ride home...Mike found a new way to go that only takes us about 3hrs instead of 4. Reagan started getting a little antsy the last 1/3 of the drive but overall she did well. Once home, Mike watched Reagan and I took a nice long nap! That was a nice Mother's Day treat! Mike (and Reagan) also gave me day at the spa which I can hardly wait to use! My mom was busy watching the Celebrity Apprentice Finale tonight so we skipped our dinner plans and Mike and I ordered in. Probably a good idea considering Reagan was so super animated. She just crashed so it's time for me to do the same. I can hardly wait to sleep in my own bed! Sweet dreams! Sleep last night wasn't great. Reagan woke up at 3:30am fussing, her new favorite time to get up. We tried everything and it wasn't until she had a bottle followed by a dirty diaper that she finally went to sleep. That's a trend we've been seeing lately. I don't know what that's all about. She used to be very irregular, but it seems like lately she's going every night (which doesn't bode well for sleep). Today's birthday festivities didn't quite turn out as planned. The birthday girl is sick. She seemed fine this morning but just got worse as the day went on. She's thrown up a few times and just seems to be feeling all around miserable. Poor thing. Hopefully no one else comes down with it, considering the house is crawling with little ones. Seizures have been staying about the same...but I guess that's good considering all the changes we've been making lately. We decided to just stop the Klonopin and not do the every other day thing, so today is her second full day without it. It's not like we've seen any improvements since taking her off, but I still think it was a good idea to go ahead and get her off of it. With these seizure medications the doctors often continue adding new ones and sometimes forget all the others that they are on! I don't want her on 5 different medications and have no clue what's doing what! Of course, if we could find something (anything) at this point that would work...we'd stick with it! We're getting a little desperate. Please continue to keep her in your prayers! Our trip went suprisngly well last night. Reagan was in a horrendous mood during Bible study, poor Grandma didn't know what to do. She's not used to dealing with the fussy side. Tummy pains seemed the obvious culprit. Thankfully by the time we got home and packed the car, Reagan was exhausted and fell asleep just in time to get on the road. She slept nearly the whole drive, waking only about 10 minutes before we arrived. We got in just before 2am and we were exhausted! It's a miracle Mike (and I) managed to stay awake for the drive. 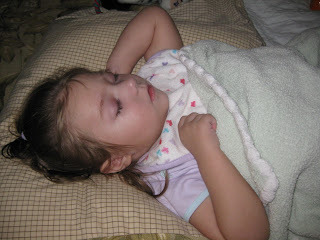 Reagan went back to sleep fairly easily (all three of us on a full size bed...imagine that) but it didn't last long. She woke up and we tried to get her back to sleep but she wasn't budging. I went ahead and gave her a bottle and that seemed to do the trick, she drank the whole thing and then managed to sleep fairly well (I guess) waking for good around 7am. We've just been hanging out around the house all day. Reagan and I did take a good 2 hr nap this afternoon. That really hit the spot. One of Mike's sister's is already here, another is supposed to get in tonight, and another tomorrow. It's going to be a full house! Today is going to be the first day of no Klonopin (please say some prayers for that). I'm thinking of giving it every other day for a few days, just to make it a little more gradual, but I'm still not sure. She was down to such a low dose as it was...only 1/4 of a pill, so I don't know if it's necessary. I also decreaesed the pm dose of Topomax starting last night. Now she's getting 6 pills of Topomax in the am and 5 in the pm. In a few days we'll go down to 5 in the am too. So sick of all this medicine...medicine that's not even doing much to help her! Frustrating. Please continue to keep her in your prayers especially through this transitional period of medication changes...so tricky. Last night was another one of "those nights". From 3:30am on, Reagan woke again and again screaming at the top of her lungs. The first few times I just ran upstairs, but when I finally gave in and brought her downstairs, things did not get any better. I know she was having some stomach upset because finally around 5am she had a huge dirty diaper…unfortunately her attitude did not get any better. Finally around 6:15am, Mike got sick of hearing her scream and he came and took her from me on the sofa and put her in bed with him. Within 5min or so, she was fast asleep! She only slept about 45min and then Mike handed her back off to me so he could go to work. That’s when she became extremely irritable again! I think she’s just doing it to spite me! Not the best of Mother’s Day gifts, Reagan. I was sure hoping maybe her pattern of sleeping was getting better, but last night would indicate otherwise. That being said, we’re making the long trek to Mike’s parent’s house tonight and we’re not going to leave until sometime after Bible study…that’s going to put us there around 2am! We’re hoping that maybe little miss trouble maker will sleep in the car on the way there. Let’s hope she can stay asleep and we can stay awake. We’re going for Mike’s youngest sister’s little girl’s birthday. She’s going to be three. Should be a fun Cajun party, lots of food and little ones. Hopefully we’ll get some good pictures. So the plan is to stay Friday, Saturday, and head back Sunday morning. That way we’ll each get some quality time with our moms on Mother’s Day. I still need to pack. I’m a classic over packer, but somehow I always manage to leave something behind. With Reagan, there's just so much we have to take along...it's easy to forget something. She's been having some serious stomach pains tonight, so I'm very concerned about our 4hr drive. Please keep us in your prayers for safe travels and keep Reagan in your prayers for less seizures and more sleep!! We're still a little up in the air about which medication to try. I spoke with Reagan's neurologist about it this afternoon and he's really pushing Keppra (since we're totally against trying Clobazam at this time). I think the plan is to start her on some B6 ASAP and then make then decide next week whether or not we want to do Keppra next. I think Mike's leaning more toward Banzel (Rufinamide)...but her neurologist is just so unsure of it right now, I don't think he feels comfortable putting her on it. Please continue to pray about this situation. We want this next medication to be "the one"...we're so sick of Reagan having to be a guinea pig with all of these medications. While I had him on the phone I also suggested that we lower her Topomax back down to the previous dose (75mg 2x day) so we can stop giving her that nasty Cytra. She just hates it! It seriously takes me 30min to syringe 0.75ml of this stuff into her mouth, with her fighting and choking the entire time! He said that we can lower the Topomax, but we can't stop the Cytra until we do labs next week (he's worried about her going back into metabolic acidosis). So last night something amazing happened! I don't know if it was the extra prayers or what, but we put Reagan in her crib (not on the sofa) at 11pm and she slept through til 6:45am!!! She did wake up at least once with some minor fussing, but she managed to get herself back to sleep and that's "through the night" in my book!!! This is the first time she's slept through the night in weeks!! Ahhhhhh...it was so nice! Then today Reagan and I both went in for a haircut! I've been needing one for months and this was Reagan's first! She was so good! My mom held her as they did it and she didn't make a peep! I only had an inch or so taken off because I still wanted to be able to pull it up in a pony tail. You can't really tell she had it done, it basically just evened it out a little. OK, so it would be an understatement to say we need some prayer. We're at a crossroads of sorts. It's time to choose yet another seizure medication. Reagan has suffered for 20 months with these nasty things that have negatively impacted every aspect of her life...now we must choose medication #12. Only this time I don't want to just eeny meeny miny moe it. Our doctor has thrown yet another medication into the pot. Here are our choices...1) Keppra, 2) Banzel (Rufinamide) , 3) Clobazam. So we've tried Keppra before. It was almost a year ago and it was shortly before Reagan tried ACTH. She was already a fussy child and the Keppra seemed to make things worse (it's known to cause something they call Keppra rage). We discontinued it after only a two week course, but in that time we saw no improvement seizurewise. Reagan's new neurologist (we had a different one at the time), thinks that we didn't really give it a fair shot. It's a fairly benign drug, other than the irritability factor, there aren't many negative side effects. The irritability can be thwarted (supposedly) by starting her on vitamin B6 about a week before starting the Keppra. So that's Keppra. Not many negatives except maybe that we've already kind of been there done that. But who knows. Banzel is a drug that is newly approved by the FDA to treat Lennox Gastaut Syndrome in kids 4 and older. What I like about this is that Reagan's seizures have a lot of similarities to LGS (well, I don't like that, but it makes sense that it might help her) in that LGS is associated with very difficult to control seizures. The only problem is that Reagan's neurologist is really shying away from trying this one. He brought it up initially, but now he's really backtracking on it. He just said that he doesn't know of anyone that has used this to successfully treat children Reagan's age (usually they are older). I don't know of any huge side effects for this one either (please let me know if you do). Then there's Clobazam. This one came completely from left field. He's never mentioned it before and I was suprised to hear him suggest it considering we're just now finally getting her off of Klonopin. They are from the same "family" of drugs (only this one you have to get from Canada) and both of them are known to have major issues with tolerance AND withdrawal. That being said, I just don't know if I have it in me to try this one (not now anyway). Getting Reagan off of Klonopin may be one of the hardest things we've ever done! She is going into these screaming crying fits starting late afternoon and lasting through the night each night. It's horrible! She's not sleeping either. Not at all. It's killing us. It's supposed to be similar to narcotic withdrawal. Lovely. So...I don't know if Clobazam is a good one to try right now. Maybe it's all hype? Who knows (no really, who knows)? So that's it. Those are our options right now. I'm not heavily leaning any which way. In my mind it's more between Keppra and Banzel...but our doctor is opposed to Banzel right now so it may just be Keppra. I still have no idea. We're going to sleep on it tonight (and pray on it). He's supposed to call back tomorrow so we can let him know what we want to do. What I'm asking is that everyone that reads this would pray about this issue as well. Pray hard. And please let me know if you feel strongly one way or the other. We need some guidance here God! We are SO sick of seizures. On a lighter note (kind of), today's ophthalmology appt went fairly well. The secondary cataract in her left eye is still there, no surprise, but the doctor thinks it's OK to wait until after our surgeon gets back from maternity leave to do the surgery. It will probably be sometime early July is my guess. One thing that did concern me a little is that Reagan's interocular pressure was a little high. When you have cataract surgery, you have to be monitored for the rest of your life to check for glaucoma. The resident that checked the pressure, rechecked a few times, but said that the slight increase was probably due to her squinting trying to keep her eyes closed. I don't know. It made me a little uneasy. Keep that in your prayers as well. While you're at it, throw in a few for sleep! Sleep, or lack thereof, is still brutal. Reagan continues to wake with her screaming fits, although she did have one good longer stretch of sleep, which is more than we can say for the previous nights. That last stretch of sleep must have really hit the spot because she woke up this morning in a great mood. We had just enough time for medicine and some milk before we had to hit the road for therapy. She had feeding therapy first at 10am and occupational therapy at 11am. She did pretty well in both and crashed in her car seat immediately afterward. She was out cold! We took this opportunity to run by the eyeglass place to pick up her new pink frames (sorry, these glasses are just too expensive for her to have both a pink and blue pair). I carried her in, they tried them on her, and we left without her ever batting an eye. I never heard from her neurologist today. I wish I could say I was surprised but I'm not. And I've got a list of things I need to discuss with him, so he better get around to calling us back tomorrow. We've got an early 7:30am appt with the neuro-opthalmologist tomorrow...which means we need to leave super early at 6:30am. Yuck. It's been a month since we last saw her and she wanted to check Reagan's left eye again for any worsening of the secondary cataract she found at her last visit. I keep hoping that maybe it's gone altogether. I hate the idea of her having to have yet another cataract surgery...and I really don't like the chance that it might have to happen before her surgeon comes back from maternity leave. Please say some prayers in this area. If it hasn't gotten any bigger, then at least that will buy us some time. Last night was quite possibly the worst night of sleep ever! Reagan was so restless and upset. We'd get her down and then by the time we would crawl into bed, she'd be screaming again. She woke at least 20 times, probably more. I just don't know what it is. Maybe it's the weaning of the Klonopin. I had always heard that this was one of the nastiest drugs to wean off of. She's having these screaming fits off and on all through the day as well. I know part of it is definitely teething, she's got those second molars coming in (#17 just popped through on the lower left side) but I'm guessing it's a little more than that. I'm definitely putting a call in to her long lost neurologist tomorrow morning. We need to know "what next". I think I already know...it's either going to be another try with Keppra (which we didn't really give a fair shot the first time) or the newly approved drug Rufinamide/Banzel. Personally, I'm not leaning one way or the other. I guess I'm just not sure of anything anymore. After 11 different attempts and failures, it's hard to know what to do. Please keep all of this in your prayers this week. Seizures are so difficult to treat...even the doctors are reduced to just making guesses. When Mike came home from his most recent trip to Canada, he brought back with him an issue of Newsweek titled The Mystery of Epilepsy: why we must find a cure. It had a few very insightful articles in it and I was encouraged by the attention that this underfunded and misunderstood disease was getting. 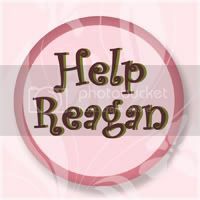 I invite you to click on the links and read a little more about the disease that Reagan battles on a daily basis. Today has been a better day. Last night (and really all day yesterday) was rough to say the least. Reagan has been getting really feisty lately as the day goes on. She didn't sleep well last night, which was to be expected. We just started her out on the sofa and she still woke crying many times, but at least we didn't have to run up and down the stairs. Today has definitely been better for her. She's been super talkative all day. She'll go on and on like she's speaking sentences only it's pure gibberish. So cute. Of course when you want her to do it, she's as silent as a mouse. As we were headed to church tonight the fussiness set in. I was worried that she'd cry the entire time and it would be a miserable experience for those watching her. I kept watching the big screen at church worried that they might put our number up there, which means come and get your kid quick! But it didn't happen. We went and picked her up and they said she was happy and smiley the entire time! Not a peep! Way to prove us wrong Reagan! The woman that watched her (the same one from last week) is a friend of the couple that heads up our Bible study. She told us that last week, when Reagan fell asleep during church, her friend just held her and prayed for her the entire time. How sweet is that? This is someone that we don't even really know, so touching. It's crazy when I think about how many people out there are praying for Reagan. People that we don't even know, taking time out of their daily lives to lift our little girl up in prayer. It's amazing. We are forever grateful to each and every one of you. At Bible study last week someone suggested praying for Reagan as soon as we wake up. Since her seizures are typically at their worst in the morning, lift her name up in prayer before even getting out of bed. I've never thought about it that way, but it's a great idea. It's going to be hard for me because I am NOT a morning person and I usually wake in a frenzy to a crying child. Something to try this week.